As we come into 2019, the world continues to grapple with the consequences of ever-growing technological developments, protracted conflicts between nations, emerging social movements, and shifting political landscapes. In a society experiencing unprecedented opportunities for global interconnectedness, international law remains a critical tool for examining and providing solutions to persistent questions of justice, efficiency, and equity. 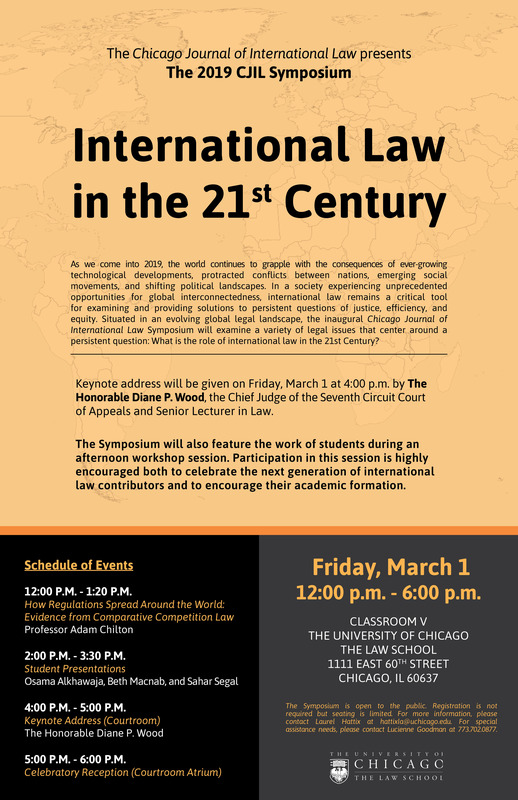 Situated in an evolving global legal landscape, the inaugural Chicago Journal of International Law Symposium will examine a variety of legal issues that center around a persistent question: What is the role of international law in the 21st Century? Adam Chilton will open the Symposium with a lunch talk at 12:15 p.m., and a keynote address will be given on Friday, March 1 at 4:00 p.m. by The Honorable Diane P. Wood, the Chief Judge of the Seventh Circuit Court of Appeals and Senior Lecturer in Law. The Symposium will also feature the work of students during an afternoon workshop session. Participation in this session is highly encouraged both to celebrate the next generation of international law contributors and to encourage their academic formation.